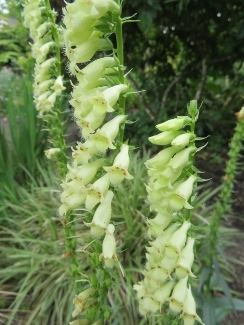 Joy Creek Photo Archive (c) all rights reserved Digitalis lutea has been absent from our catalogue for several years, but not forgotten. This is distinguished by its racemes of very narrow short yellow flowers and its glossy, lance-shaped, dark green foliage. An easy-to-add complement to the mixed summer border. Summer. 24 in. x 12 in.